One of the most innovative brands in the vaping industry, Haze Technologies have been in the front of cutting-edge vaporizer innovation. I’ve been hooked to Haze vaporizers since I first heard about them in 2014. Haze has been founded a year earlier and has released their “game-changing” vaporizer device in the Haze Dual. It has earned two more iterations since its release in 2014, though it left many fans --like me-- wondering what’s next for the guys at Haze Tech. Several years later I’ve heard that apparently, they’re about to top their game by releasing what they call the Haze Square Vaporizer. It’s a four-chambered portable vaporizer that won’t only be able to hold four times the amount of material at the same time but can also take in almost all kinds of materials --and you’ve guessed it-- all at once. I could imagine the Square spanning every angle of vaping, encompassing and breaking almost every boundary making it THE true multi-function vaporizer every cannabis consumer has ever dreamed of. As a dry herb consumer, myself, I have always been satisfied with the performance of my Haze Dual, so you’d imagine how happy I was and how high my expectations were when I received my vape mail. I ordered the Haze Square Pro which comes in a white box that’s sealed in plastic. After peeling the plastic off I immediately began to pull the cover from the box itself. I was quickly welcomed by the instruction manual that says “Haze Square, first and only quad chamber on demand convection vaporizer.” This right off the bat tells you pretty much how the Haze Square works, four chambers and a fast heating convection oven. I’m pretty stoked about it so let’s continue. The instruction manual is pretty decent, it has some detailed explanation from device startup to care and maintenance. The layout of the product inside the box is somewhat simple and minimalistic. The first layer contains only the Haze Square vaporizer and the lower stack reveals some of its inclusive accessories like the charger, --that’s as big as the vaporizer itself-- some tweezers, a cleaning brush, and two data cables --one for charging and one for connecting your Haze Square Pro to your computer or any similar portable device. I was expecting to find some sort of mouthpiece inside but the Haze Square Pro’s mouthpiece seems to have been integrated to the vaporizer itself which I find kinda neat. Overall, the packaging of the product is solid, something you’d expect from a top-tier device. The accessories and other vaping essentials are securely situated in dedicated compartments which means they don’t smash into each other during shipment and that the unit is held in a strong and sturdy box keeping what’s inside safe. 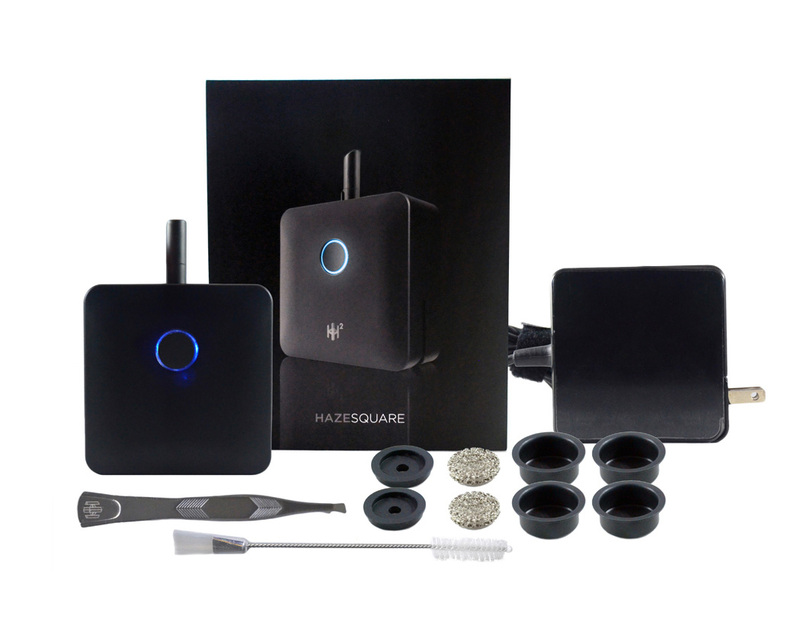 So now to the fun part, the Haze Square Pro opens up by twisting the thumb screw on the body of the vaporizer counter-clockwise. This allows you to detach the chamber tray from the part of the vaporizer that holds the heating component. The loading tray obviously is the thinner of the two and the thicker, heavier of the two halves holds the heating component. The loading tray is removable making the parts relatively easy to clean, it’s quite important especially for heavy consumers like me who tend to go over several sessions daily. Of course, the more you put your vaporizer to use the more resin and residue build up it gets. Each chamber holds up to 3 grams of dry herb each, I currently have no wax or oil concentrates available so I proceed with loading dry herb materials to the chambers, the only variety I have are with strains and I prefer loose-leaf strains that tend to be heavy on THC. It's good to see that the chambers come with concentrate pads which makes the holding of fluid materials easier reducing the possibilities of leakage. I begin packing finely ground botanical matter to the pods, in my past experience, I found that ground herbs with fluffy consistency, packed loosely to the chamber tend to have better results especially when working with convection type vaporizers. The hot air permeates the herbs better on a loosely packed chamber compared to having a tight load, this provides your herbs with an ideal environment which lets the hot air to freely circulate the chamber allowing you to get evenly heated herbs and better-tasting vapors. Honestly, I imagine that a variety between wax, oil, and herb will probably work best for the Haze Square Pro since I found it hard to differentiate the strains I was vaping on only because the more I draw, the higher I get. There’s a slight difference in taste per pod but the overall outcome is the same. I believe I’d get the most out of the four chambers by loading different kinds of material though having four times the capacity doesn’t seem bad. If there’s any upside to having four chambers loaded with a single dry herb strain is that you keep your materials fresh after every pod and there’s no need for stirring. I'm used to working with the Haze Dual and operating the Haze Square Pro is pretty much the same. I think that the lack of an LCD screen will force a learning curve amongst other vape users, especially those who are used to using vaporizers with a HUD. The Haze Square Pro features five preset temperature settings that can be customized and accordingly adjusted via a downloadable app which not only allows you to alter the preset temperature levels but also to personalize the LED colors and haptic feedback and notifications like lights and vibrations. The power and firing button can easily be located on the other side of the vaporizer. By tapping it three times, you can turn the Haze Square Pro on. I held the firing button until the LED light no longer blinks which signals that the vape is now ready to use. As mentioned above, the longer I draw, the higher I get. I also noticed that the vapors immediately give fuller flavors, and that Haze’s smart temperature technology conveniently remembers my last preset setting. As expected, the Haze Square Pro performed pretty well in my opinion. The only drawback of having a four-chambered convection vaporizer especially when you’re always running on high settings will quickly drain your battery. In a single charge, I was able to squeeze out 30 plus draws, it’s hard to keep track after the 20th hit though. The battery charges in less than an hour which makes the Haze Square Pro a solid vaporizer overall.